Racers line up for the start of the 5K. Photo by Neve Pollard. 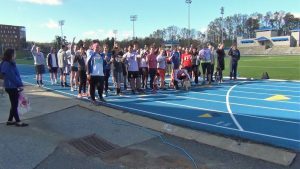 UNC Asheville students and local residents enjoyed sunny skies, a 5K run and supported a great cause during She’s the First’s third annual Cupcake Classic 5K and Carnival on Saturday morning. Meredith McLain, a junior political science student and president of UNCA’s chapter of She’s the First, explained the goal of the organization. McLain expanded further on her involvement with She’s the First and said how she became president of the university’s chapter. The proceeds raised from entries in the 5K, McLain said, will be applied toward providing necessities students will need as they move forward with their education. 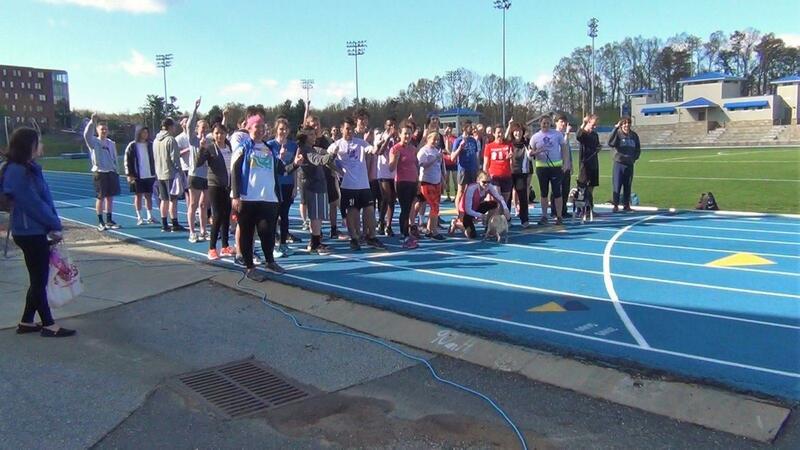 Other organizations were represented at the event, including UNCA students involved with Autism Speaks, an autism spectrum disorder advocacy and awareness group. “We’re with Autism Speaks, which is a national philanthropy that works with people who have autism spectrum disorder. I’m one of our philanthropy chairs, so I work very closely with them,” Sarah Hesselink, sophomore political science student, said. Hesselink, who works to raise awareness of autism along with other members of UNCA sorority Alpha Xi Delta, said there is a camaraderie and helpful spirit among organizations like Autism Speaks and She’s the First. Devin Clancy and Rhonda Becker, who served ice cream at the event on behalf of The Hop Ice Cream Café, said education is important for all,and The Hop is more than enthusiastic when it comes to supporting a noble cause. Clancy said education in today’s world is out of reach for too many people and ice cream is a great way to bring people together and raise money at the same time. Becker also said The Hop’s owners, UNCA alumni Ashley and Greg Garrison, make it a priority to give back to the city they love, especially when it comes to working with their alma mater. “Greg owns The Hop, and he’s always been super involved with the community and making sure he can do whatever he can to help, and we love being a part of that,” Becker said. Selling ice cream may seem like a simple idea, but Clancy, originally from New Orleans, said there is much more to it than that. “What ice cream does, bringing people together, that’s what education does. It’s not so much about sitting in a classroom absorbing information, it’s the relationships you build in the classroom,” Clancy said. Lots of UNCA students came out to support She’s the First and participate in the 5K run. Robert Worthington, freshman nuclear engineering student and member of fraternity Alpha Sigma Phi, came out with other members to enjoy some exercise and fellowship. Alex Bortey, a fellow Alpha Sigma Phi member and freshman engineering student, said he enjoyed the run and having other Alphas with him helped to push himself. Not only were UNCA students showing their support for She’s the First, but members of the wider Asheville community came out to enjoy the weather and the occasion.